Maybe you have heard the term “video snacking” in regards to consuming online video content or maybe this is a new one on you. It has nothing to do with wolfing down mini Reese’s peanut butter cups by the handful; not that there’s anything wrong with that. But it may be more similar to this than you may think. Snackable content on the web refers to how people browse and search for information. Usually it’s somewhat casual poking in to read something, watching a quick animation, reading product reviews, etc. When you market online you don’t have people’s attention for very long. In a blog post I wrote about online video viewing habits – 10% of your audience clicks away after only 10 seconds and more than half click away after a minute. More than half of your audience leaves after one minute. This is why it is critical to make sure you keep your video content short. Here’s where the snacking comes in. If you try to cram everything you do into one video it’s going to get longer and less focused. That’s how you loose viewers online. You are better off creating shorter, more focused videos because the end user is more likely to consume more of your content that way. That’s because most video viewers don’t specifically go looking for video – they come across it while browsing a web site and are curious. So they click to watch. If it’s less than a minute, there’s very little time commitment needed. 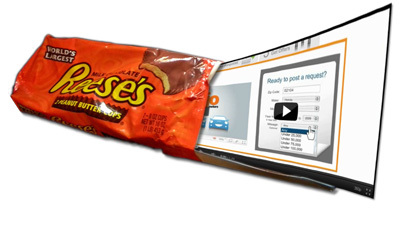 Video snacking feeds that curiosity and keeps people engaged on your site for longer periods of time. As an example – let’s say you make software. Your lead video should be a very short and focused video of what problem your software solves. Then there should be a call to action either in that video or around it to watch a short video about how the software works. From there you can keep linking through calls to action to short 10-30 second videos throughout your site of customer testimonials, specific functions that the software does to make the user’s life simpler, etc. You should also sprinkle these video clips throughout your website. Have a technical specs page? Include a few videos showing some in-depth features or “How to” style tutorial animations. Have some case studies? Include video testimonials from some of those customers. Snackable video content on your website allows the consumer to feed their inquisitive nature while at the same time passively pulling them closer to a purchasing decision. One video clip at a time. To bring those Reese’s peanut butter cups back into the analogy; it’s the difference between a Reese’s King Size and a bag of Reese’s Miniature Cups. If you leave a stack of Reese’s King Size with four full peanut butter cups per package in your lobby area, the casual passer by may think it was left there for someone else or they may possibly pick one up. If they do, they may just eat one or two of those peanut butter cups but by the time they get to that third or fourth full peanut butter cup, unless they are a teenage boy with a cast iron stomach, they’re probably feeling sick and full of regret. Then try putting a bowl of tiny Reese’s Miniature Cups in the lobby. They were “created” to be a browsing snack. People will grab one without even thinking about it. They will grab a couple for their friends. Before you know it the whole bag will be devoured and people will be looking for more every time they walk by.